Fantasy in the Sky: An Interview With a Pyrotechnician — Everybody's Invited! John Albert is retired from a rather explosive career. For nearly 20 years he worked in the entertainment division at Walt Disney World, specializing in pyrotechnics. Can you imagine a more exciting job than designing the big fireworks shows at Disney? Neither could I. That’s why I was thrilled when John agreed to talk with me on the phone about his career. Read on to find out how the industry has changed, and what’s next for the world of pyrotechnics. Everybody’s Invited! : How did you get involved in pyrotechnics in the first place? John Albert: I was fascinated by fireworks as a kid. I’m originally from Wisconsin, and for a couple of years after the Second World War, retail fireworks were still legal there. At that time, the emphasis on July 4th was consumer fireworks, instead of the public-display type. Some states sold them all year round, some were limited to a week before the Fourth of July, and (mainly in the South), also at Christmas and New Year’s time. I’ve fond memories as a small child of the fireworks stands in my small home town. Back then, “commercial” (consumer) fireworks were still mainly made domestically, and were a little more high-powered, a little noisier, and easier to hurt yourself with. I was fascinated with that stuff. In 1948 Wisconsin outlawed consumer fireworks, and I thought, “This stinks.” So I had a longing to one day do something with fireworks. Inescapabably, one grows up and must learn a living, and so I decided to attend college. I graduated from the UW-Madison in the mid-sixties with a Landscape Architecture degree. That was what I went into initially, although I was involved in fireworks as a hobby. The move to Disney happened around the time of the Bicentennial activities. It wasn’t that I didn’t like what I was doing, but just felt that I needed a change. I wrote them an open letter in late 1975, and after several interviews, etc., about a year later I was offered the job. EI! : What were you responsible for when you worked for Walt Disney World? JA: When I was hired by the Entertainment Division in 1977, I was essentially the supervisor for the fireworks storage and packaging facility at an annex off the Disney property. My responsibility was receiving, storing, shipping and record keeping of all fireworks and pyrotechnics according to federal BATFE regulations. Back then, Disney used primarily “display” (large-scale) fireworks, and most of the displays were fired during the summer season, as that’s when the Disney parks’ attendance is heaviest. After several years of primarily supporting these events, I was gradually worked into the design side of things. Starting in the early 80’s, we began getting into smaller-scale, “up close and personal,” or proximal fireworks. I didn’t have much to do with that, as most of my time and efforts continued to concern the logistical support and design for their large-scale shows, both at WDW and also at Disneyland (CA). EI! : How does it actually work? How do you design a fireworks show? JA: These days it can be done by computer. There are software programs, and the newer versions are quite sophisticated. Typically, modern shows are designed with music in mind, and are commonly referred to in the trade as “Pyro-musicals.” Every element can be precisely timed to initiate on cue. There’s usually a back-timing aspect to it. You want it to appear on a particular beat of music, so you shoot it a few seconds early. With this software, there’s usually a graphic display of the music. So you can very meticulously go in and fix points in that musical line where you want things to happen, and then you can program your design. Public firework displays years ago were smaller and simpler, and much-less regulated. In the Midwest at least, typically, either the local fire department or a civic sponsoring group would order fireworks shows from manufacturers that sold them from catalogs. Such catalogs were sent out in late winter, and these groups would select shows that best fit their budgets. The shows were usually hand-fired (with road flares), and typically didn’t last more than a half-hour. They were very often pretty boring, usually being shot by members of the sponsoring group, who typically felt that a longer show was more impressive, given that their often-limited budgets didn’t buy a lot of product. You could clean off your glasses or blow your nose three times in between aerial bursts. Generally speaking, since those days, in almost every sphere of entertainment, audiences have grown more sophisticated in their expectations. The bar has been raised, aesthetically, and that’s a good thing — people want to be impressed. EI! : How dangerous is it? EI! : I know that you’re retired from Disney. Are you still involved with fireworks? JA: There’s a Florida Disney fireworks supplier at whose factory and under whose BATFE license I periodically do experimental development work. I primarily investigate aspects of fireworks involving “new” effects. I work at a very small-scale (always with minimal amounts of compositions! ), in a very rudimentary “laboratory.” Occasionally, something works, and then the company (and sometimes Disney, too) can benefit from it. I just do it for the fun. Such exploring and keeps my mind active and also current in the fireworks business. It’s pretty much my only real hobby — I don’t play golf. EI! : Is it a very competitive field? it once did, 50 or 60 years ago. Almost all firework displays today are “turn-key” events, featuring mainly imported products; a reality driven by often fiercely competitive bidding between companies vying for selection. Typically, the sponsoring groups contract for all services related to staging their displays, from delivery to firing to clean-up. The main reasons for this shift have been 1) our growing population and 2) rising labor costs. Population growth has driven the inexorable intrusion of commercial and residential sprawl into semi-rural areas near cities, where fireworks companies typically located years ago. Because of ever-increasing minimum distances for public safety mandated by government regulations, many older manufacturers have been essentially squeezed out of existence, being unable to afford replace their older, outdated facilities with brand- new ones on usually much more expensive land that was a lot more remote from major population or transportation centers. 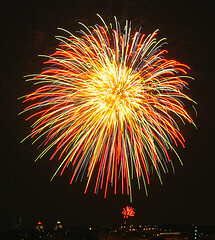 Increasing labor costs have also curtailed domestic fireworks production, as most civilian manufacturers historically depended upon a low-as possible, minimum-wage-scale work- force to manage overhead costs in a very competitive sales environment, especially for their retail or “commercial” products, and—to a slightly lesser extent—their “display” or professional product lines. Taken together, these demographic and economic pressures over the years since World War II have combined to render it ever more difficult for US-based firms to compete against foreign imports, especially those from China. This is why fireworks contractors today must depend upon such low-cost imports to be competitive. Historically, US firework makers have always been privately-owned, family concerns with minimal profit-and-overhead margins and therefore, the constant need to keep operating expenses as low as possible. Because of this, this miniscule sector of the economy has always been extremely affected by the economy’s negative fluctuations. EI! : What would you recommend to someone who was interested in a career like yours? which began in the middle 1700s. Various states have chapters, and I have belonged to the Florida chapter. Like any other hobby group, they attract similarly-interested people, and meet a few times a year. The government isn’t too concerned, as long as they have an ATF permit and operate safely in a safe place, like out in the country. The goods that are made aren’t considered to be “in-commerce,” because they’re experimental. PGI trains neophytes in safe ways of handling various sorts of powders and devices. The art and craft of pyrotechny is being perpetuated by such amateur groups, though the few old companies—some 3rd or 4th generation, are still the “movers and shakers” in the trade. As you may have surmised, it’s one of those crafts that you have to learn safely, step-by-step. Even with just a rudimentary understanding of chemistry, you can appreciate that there are certain chemicals that you do not want to mix together. You first want to learn “what not to do,” so that you’ll still be around to come to work tomorrow! EI! : How is the industry faring these days? JA: Everything in the world goes through change. Similarly, the business of fireworks-making has always been in a state of flux, either because of government regulatory pressure, or commercial-financial stresses. It gets harder and harder to “make a buck,” as in almost any business these days. I don’t say that to be pessimistic. As in any business, those that survive are the ones that constantly redefine themselves and how they do business. One thing that impressed me early on about most fireworks trades-people, worldwide, is that they tend to have survivor mind-sets! EI! : Is digital entertainment killing live fireworks?